Most homes have a garden shed. They come in all shapes and sizes and also many prices. When building your own home a shed will be high on your list of priorities as it will be used to store tools and materials early in the build. Try to have the largest shed possible as you will be surprised what sort of uses it will have not just during the build but afterwards when it is part of the garden. Think what its future use will be, perhaps storage for the garden and children’s toys. It could be a pool house if you are planning to have a swimming pool. Alternatively it could be used as a workshop or an outside office – in effect another room so you need to buy the right size to begin with. Decide where the shed should be sited. It is not just where it needs to be to store items for the build but where it will be needed later on when the house is finished. Although most sheds are self assembly so could technically be disassembled and erected elsewhere you do not want the trouble of doing it and the building may be affected by being pulled to pieces. Although sheds can be sited on a few paving slabs you really need to have a good base for a permanently sited shed. Dig shallow footings, fill with rubble and pour cement into the base. Ensure that the cement is level otherwise water will settle and get into the structure of your wooden shed. Although it is easy enough to build a shed from scratch why bother? The time it would take is not worth the hassle. There are so many sheds ranging from one hundred pounds upwards that it is better to purchase a complete kit and erect it yourself. Most companies will deliver the shed – some will even erect it for you. But, as you are about to build a house it seems silly if you pay someone else to do a job that will only take a few hours with the help of another adult to hold up the sides while you hammer and drill. 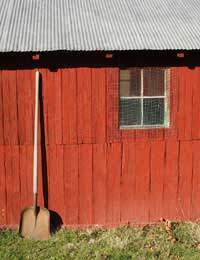 The wooden shed will rot if it is not protected with some form of treatment. This can be easily painted over all exposed areas and can also add a stain to the wood at the same time. Why not insulate the inside of your shed and make it more resistant to cold weather? A few wall boards pinned into place will not cost a lot of money. You could even use the off cuts from your house build. If your shed is to be used as a workshop or as an office it will require heating and a supply of electricity. Plan a power supply when arranging the electricity supply to your home. If the shed is used early in the build for storage then run a temporary cable to the shed from the house supply. For heat, a small wood burning stove would be ideal. The stove could use up all the odd pieces of wood left from your house build.